Welcome to our Toronto Wedding Flowers section. Due to popular demand we have created this new Toronto Wedding Flowers section. It is still under construction but we hope to have it completed soon. 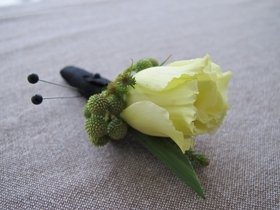 During wedding consultations we were told repeatedly by brides to be that there is a need for a site where they could go and select bouquet, centrepiece arrangement or boutonniere. All done in a simple click and order fashion. Guess what, we have listened and now we deliver. Since every order is custom made we need some extra time to get specific blooms for your bridal bouquet, corsage or stunning ceremony flowers. Now you can place an online order for your all Toronto wedding flowers. All we need is 21 days advance notice, product numbers and their quantities. That’s all. You are in control; you can mix and match between different products in each category. When you are done, email us your selection or call us, we will ask you a few questions and start working on your wedding order... Of course if you wish to see us, we will be glad to meet with you; please bring your list with you to discuss the details.